No official word from the university yet, but the New York Daily News is the first to report that Charlie Weis has been fired by Notre Dame. I, for one, will be sad to see him go, because Weis was a living monument to the hubris and folly of his school and its supporters. (For example, this book was actually written and is still available for sale via their ESPN.com clubhouse page.) 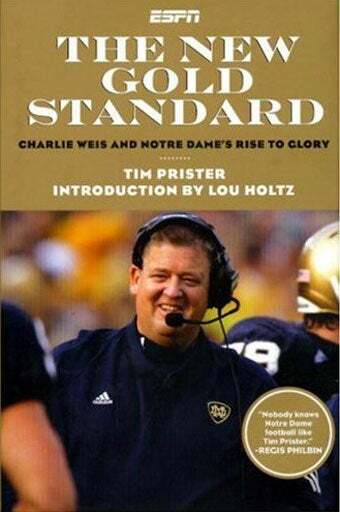 Just seven games into his first season as head coach, Notre Dame handed Weis a nonsensical ten-year contract extension lashing themselves to his rather prodigious anchor until 2015—despite the fact that the coach he replaced had an identical record at the same point the year before (and also started 8-0 in his first season) and was fired for it. Five years later, he finished with a lower winning percentage than that previous coach and his team has become a punch line. It will now reportedly cost the school around $18 million just to run him out of town, while they naively cling to the belief that the Fighting Irish name alone will be enough to persuade A-list college coaches to ditch their actual successful programs to come run this terrible one. Good luck with that. However, I will mostly miss him because his teams were lousy and I enjoyed watching them lose.